The STEP OILTOOLS range of cuttings containers are designed with innovative features to improve safety and increase operational efficiency. 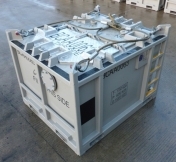 All the containers are designed and built to DNV 2.7.1 / EN12079 and are stackable to reduced deck space. Each container has two light weight lids and a number of inlet and outlet points for use with cuttings auger systems, vacuum system and pneumatic conveyance systems. Large sealed Lids; One steel lid and one lightweight aluminum lid for easy of operations and improved safety. Improved stackable design to reduce deck space and reduce the risk of snagging and tipping during crane operations.